This was originally published in the Coloradoan’s Newspaper here. A recent article (Oct. 5) featured the owners of several restaurants in Old Town. 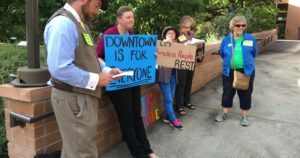 In its rush to laud local business owners, the Coloradoan failed to address the very real consequences that gentrification is having on marginalized people in this community. There is an apparent lack of historical and political understanding in Fort Collins of how space is divided up not only by private businesses, but also by laws enforced through the coercive power of the state. Who may use certain spaces and what activities are allowed in them is heavily regulated and policed. Much of our legal system creates and protects the boundaries and value of private property: This includes regulating the use of public spaces in the interest of private profit. Prior to the privatization and commodification of the land where Union Restaurant now stands, Jefferson Park was a public space that sometimes served as a place to rest, eat and simply exist for people who have been forced out of other spaces. While some in Fort Collins may celebrate having a new venue to eat lunch, others are left with even fewer safe places to be. The building of Union pushed people farther into the margins, without contributing to real solutions. Our community should be honest about the reality of development decisions that push vulnerable people out of public spaces. These exclusionary practices do lasting damage to individuals and our community. 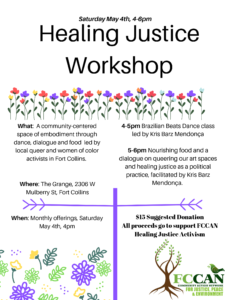 The Fort Collins Homeless Coalition works with people in poverty and people experiencing homelessness in our community to build grassroots power, decriminalize homelessness and to organize together to address the disparities perpetuated by capitalism and other systems of oppression. Are you interested in working with us? Find ways to get involved!